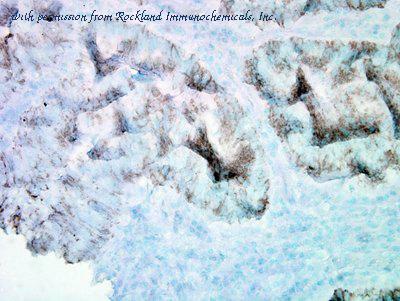 Immunohistochemistry analysis of human adrenal tissue stained with HSP60, mAb (LK-1) at 10µg/ml. Western blot analysis of HSP60: Lane 1: MW marker, Lane 2: HeLa (Heat Shocked), Lane 3: 3T3 (Heat Shocked), Lane 4: PC-12 (Heat Shocked). 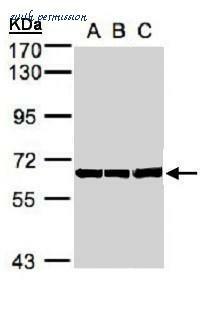 The HSP60 antibody from Proteintech is a rabbit polyclonal antibody to a recombinant protein of human HSP60. This antibody recognizes human,mouse,rat antigen. 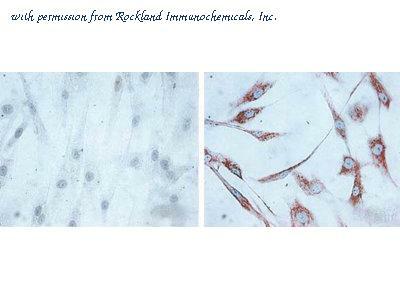 The HSP60 antibody has been validated for the following applications: ELISA, IF, IHC, IP, WB analysis. 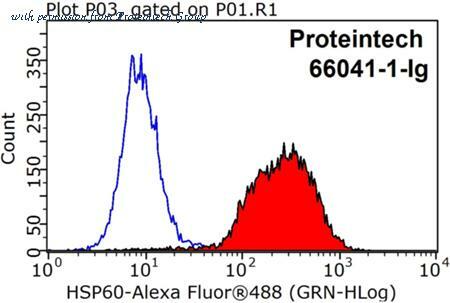 The HSP60 antibody from Proteintech is a mouse monoclonal antibody to a fusion protein of human HSP60. This antibody recognizes human, mouse, rat antigen. The HSP60 antibody has been validated for the following applications: ELISA, FC, IF, IHC, IP, WB analysis. Immunofluorescent analysis of Heat Shock Protein 60 using Anti-Heat Shock Protein 60 Monoclonal Antibody (4B9/89) (Product# MA3-012) shows staining in Hela Cells. Heat Shock Protein 60 staining (green), F-Actin staining with Phalloidin (red) and nuclei with DAPI (blue) is shown. Cells were grown on chamber slides and fixed with formaldehyde prior to staining. 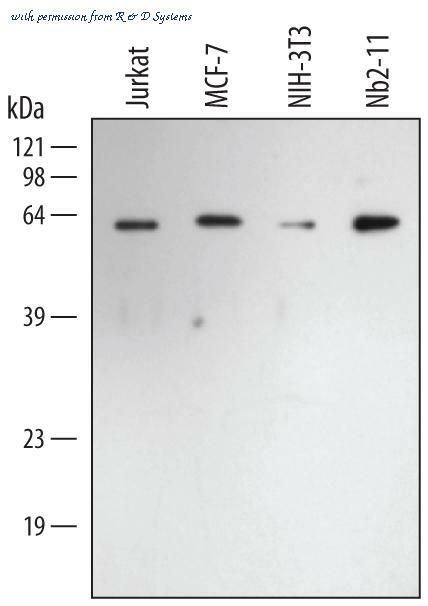 Cells were probed without (control) or with or an antibody recognizing Heat Shock Protein 60 (Product# MA3-012) at a dilution of 1:100 over night at 4 ?C, washed with PBS and incubated with a DyLight-488 conjugated secondary antibody (Product# 35503, Goat Anti-Mouse). Images were taken at 60X magnification. Immunohistochemical analysis of paraffin-embedded lung cancer tissues (left) and kidney cancer tissues (right) using MA5-15836 anti-HSP60 antibody with DAB staining. Immunocytochemistry/Immunofluorescence analysis using Rabbit Anti-Hsp60 Polyclonal Antibody (SPC-105). Tissue: Heat Shocked Cervical cancer cell line (HeLa). Species: Human. Fixation: 2% Formaldehyde for 20 min at RT. Primary Antibody: Rabbit Anti-Hsp60 Polyclonal Antibody (SPC-105) at 1:100 for 12 hours at 4°C. Secondary Antibody: APC Goat Anti-Rabbit (red) at 1:200 for 2 hours at RT. Counterstain: DAPI (blue) nuclear stain at 1:40000 for 2 hours at RT. Localization: Mitochondrion matrix. Magnification: 20x. (A) DAPI (blue) nuclear stain. 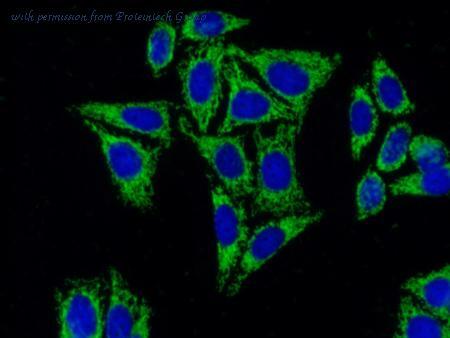 (B) Anti-Hsp60 Antibody. (C) Composite. Heat Shocked at 42°C for 1h. Immunofluorescence analysis of methanol-fixed A431, using HSP60 (chaperonin)(GTX110089) antibody at 1:200 dilution. 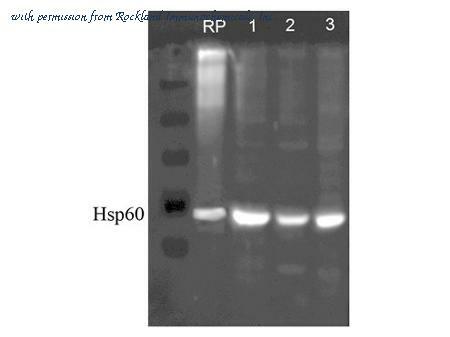 Detection of Human/Mouse/Rat HSP60 by Western Blot. Western blot shows lysates of MCF-7 human breast cancer cell line, DA3 mouse myeloma cell line, and Nb2-11 rat lymphoma cell line. PVDF membrane was probed with 0.5 ╡g/mL of Mouse Anti-Human/Mouse/Rat HSP60 Monoclonal Antibody (Catalog # MAB1800) followed by HRP-conjugated Anti-Mouse IgG Secondary Antibody (Catalog # HAF007 ). 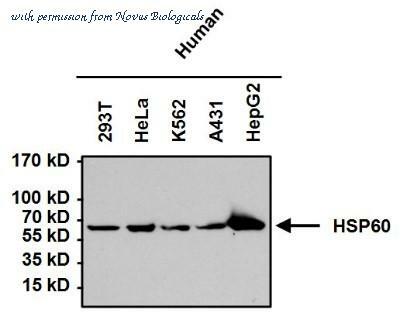 A specific band was detected for HSP60 at approximately 62 kDa (as indicated). This experiment was conducted under reducing conditions and using Immunoblot Buffer Group 2 . 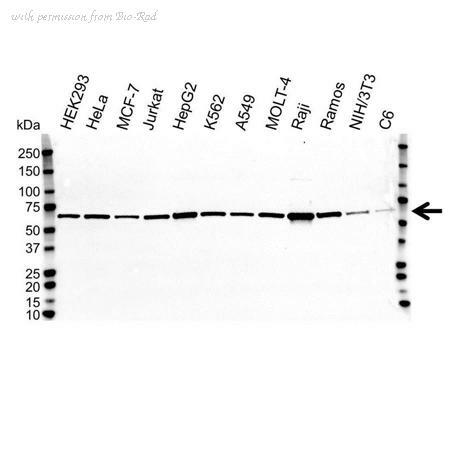 Detection of Human/Mouse/Rat HSP60 by Western Blot. Western blot shows lysates of Jurkat human acute T cell leukemia cell line, MCF-7 human breast cancer cell line, NIH-3T3 mouse embryonic fibroblast cell line, and Nb2-11 rat lymphoma cell line. PVDF membrane was probed with 0.1 ╡g/mL of Rabbit Anti-Human/Mouse/Rat HSP60 Antigen Affinity-purified Polyclonal Antibody (Catalog # AF1800) followed by HRP-conjugated Anti-Rabbit IgG Secondary Antibody (Catalog # HAF008 ). 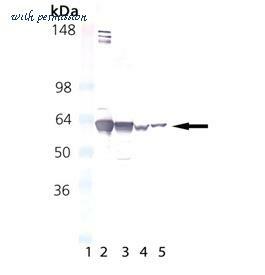 A specific band was detected for HSP60 at approximately 62 kDa (as indicated). This experiment was conducted under reducing conditions and using Immunoblot Buffer Group 1 . Immunohistochemistry of mouse anti-Hsp60 antibody. Tissue: human skin fibroblasts. Antigen retrieval: Left: control, Right: 24 hours after 7th passage of senescence. Primary Antibody: Hsp60 antibody at 1ug/ml for 1h at RT. Secondary antibody: Peroxidase mouse secondary at 1:10,000 for 45 min at RT. Localization: Nuclear. Staining: Hsp60 as brown signal. 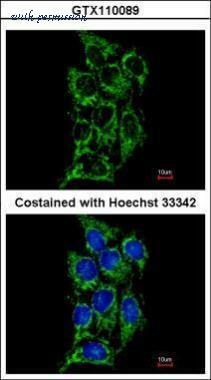 Immunohistochemistry of mouse anti-Hsp60 antibody. Tissue: human colon cancer cells. Primary Antibody: Hsp60 antibody at 1ug/ml for 1h at RT. Secondary antibody: Peroxidase mouse secondary at 1:10,000 for 45 min at RT. Localization: Nuclear. 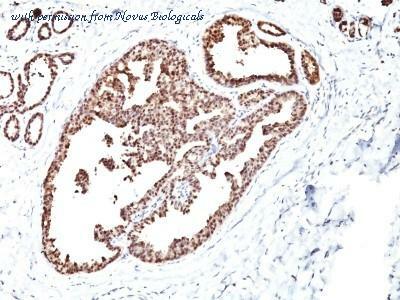 Staining: Hsp60 as brown signal. 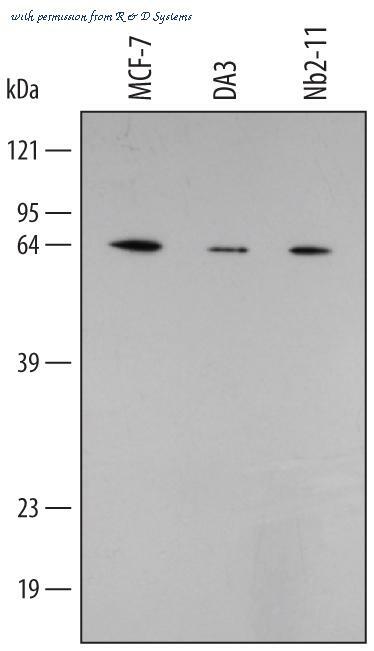 Western Blot of rabbit anti-Hsp60 antibody. Lane 1: 100ng Hsp60 recombinant protein. Lane 2: 7.5µg SKBR3 human lysate. Lane 3: 7.5µg MDCK dog lysate. Lane 4: 7.5µg MEF mouse lysate. Primary antibody: Hsp60 antibody at 1:1000 for overnight at 4°C. Secondary antibody: IRDye800™ rabbit secondary antibody at 1:10,000 for 45 min at RT. Block: 5% BLOTTO overnight at 4°C. Predicted/Observed size: 61.1 kDa for Hsp60. Other band(s): none. Simple Western: HSP60 Antibody [NBP1-77396] - Simple Western lane view shows a specific band for Hsp60 in 0.05 mg/ml of HepG2 lysate. This experiment was performed under reducing conditions using the 12-230 kDa separation system. 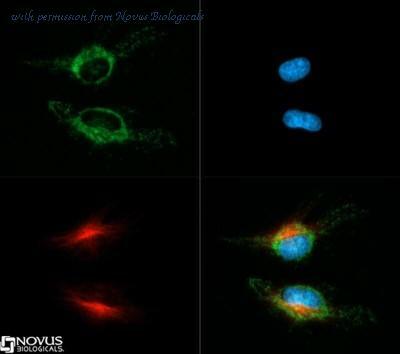 Immunocytochemistry/Immunofluorescence: HSP60 Antibody [NBP1-77396] - Hsp60 antibody was tested in HeLa cells with Dylight 488 (green). Nuclei and alpha-tubulin were counterstained with DAPI (blue) and Dylight 550 (red). 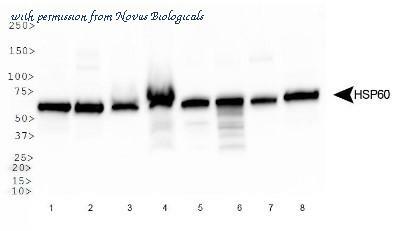 Western Blot: HSP60 Antibody (4B9/89) [NBP2-22440] - Analysis of 50ug of the indicated whole cell lysates and 15ul of PageRuler Prestained Protein Ladder.